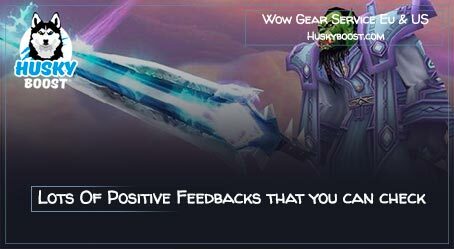 Good morning, afternoon or evening, wherever you are around the globe, be prepared to get introduced to a yet another article, describing how to buy WoW gear this time! What is the first thing a newborn adventurer sees after entering the game? Bright starting locations, for sure! Either it is brutal Durotar, bright and joyful Elwynn Forest, dying fields of Tirisfal or frozen ridges of Dun Morogh – legs of the beginning adventurer will always lead him to the nearest big city. Gigantic streets of Stormwind, confusing labyrinths of Orgrimmar, hundreds and hundreds of open houses you wanted to enter but then, an unknown player equipped with incredible armor, riding an amazing mount, passes right in front of you. You look at the tattered cloth appeal you just got from that kobolds and realize the difference. 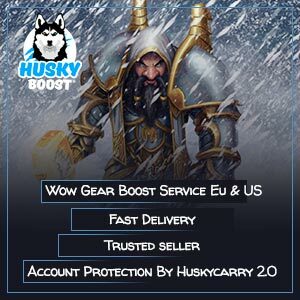 In order to do so, a certain gear boost WoW has been implemented by your own self. That exact difference between yourself and that experienced, hardened by the countless amount of battles, and taken as a Hero of Azeroth. It dawns upon you, the length of the way he has traveled. Quite a familiar feeling, isn’t it? Every player after starting playing World of Warcraft was the envy of someone or something at some point. But thanks to Husky, everyone can easily change jealousy to proudness by getting equipment improvement in the game! By now, the nearly whole heroic way of yours after reaching 110 level depends on your equipment in Legion expansion. There is a reason for the brutal demons of Burning Legion to be able to easily beat unlucky heroes. Those poor WoW fellas just forgot to get a boost to raise their ilvl and started the fight dressed in nothing but tattered clothes. At the meantime, “dressed up” players defeat hordes of enemies without having single trouble, literally killing foes in one shot. So what is different? The difference is that the best equipment gives you a lot of positive stats and the difference in 70 equipment levels is much like the distinction between an ant and a slipper. Even a five-item rank diversity makes things go in a completely another way. Ask anyone! Everyone will answer the same thing. 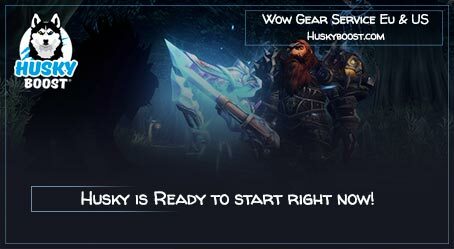 The safest way to get decent equipment in the game is to order an appropriate level up at Husky! Look through the BOE packages, choose the suitable gear and finally buy it to become stronger in WoW. So, how to get this precious equipment? It’s not that hard, you just have to farm mythic dungeons with key, instances, and battlefields over and over again. Such WoW routine may bore you quite fast so consider getting our service to improve your gear easier! Because the only problem would stand in your way – if you don’t have a decent set of equipment, you will never get an opportunity of getting into a dungeon group. And you won’t be ever able to complete a dungeon or an instance alone. No-no, it’s not about you, it is because such challenges are not oriented for solo completion. So here we are, in front of a paradoxical situation: to get better equipment, you need to be invited into a group, but in order to become suitable for one, you need good equipment. How to escape this paradox? Wherever you are around the globe, this paradox can be solved without any problems by simply contacting Husky! 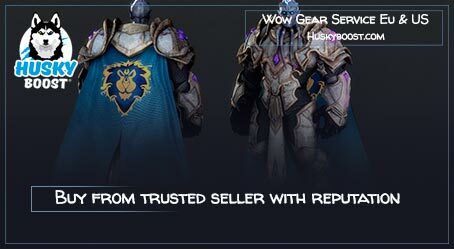 Just visit our WoW section, choose the set of gear you want to get in the end and purchase it! Everything is simple as it gets! Just relax while we will do all the work. Spend your free time on saving Azeroth from all the calamities it is suffering from. Husky will take care of making your characters suitable for a new journey! We offer a wide area of possibilities. The simplest one of them is getting your overall equipment level to 960. Which is a really decent level, honestly speaking. It is worth mentioning that a lot of players will estimate you not by equipment alone, but by the certain score as well, which tells about your approximate experience as a participant in instance clearing. The higher it will be, the better the chances of receiving an invitation to a cool group. So just go ahead, place an order to buy a run in EU region with a group of WoW professionals to increase the chance of getting good gear! There is one more point to mention. We are rather proud of it. Packs. A pack is a summation of various equipment improving options, combined into a single one MMORPG product. For example, you want to get 945 items and artifacts. There is just no point of purchasing them separately while you can order both at the same time and get a bonus of several legendaries and unique artifact weapon appearances as well! This part of the game is much easier to get by so you will obtain your items much faster! By the way, the product is capable of fitting so much useful stuff in it! I wish there was a roof to slap. 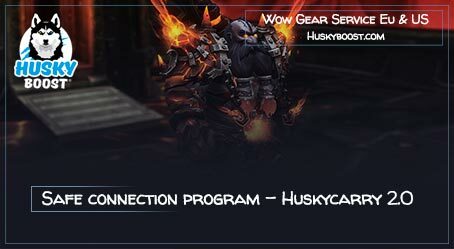 Contact Husky, buy the product and join a raid of skilled WoW players to get some quality gear in the end. In WoW, increasing the level and getting the right items is the key to complete the boost. Each in-game object has a special level which indicates its power. You can see it every time you hover your mouse over it in the inventory. The overall level of all items you have equipped accumulates a number which estimates the character’s strength. With the rising of the game’s content difficulty, rewards increase as well. Armor and other drop pieces of greater quality should allow reaching new heights of power. Thankfully, Husky has an offer that might interest you. Don’t let this chance slip away and go to waste! Get the level farmed up and become a literal god of war in the MMO! Keep in mind that any adversity you face should bring some rewards after beating it. Especially in BFA, where the gear is more important than ever before in WoW, so why not buy a special pack to accelerate the growth rate? Possession of high-level equipment unlocks a whole bunch of various features. With great strength comes great responsibility. More advanced groups will start inviting you to join their groups. More challenging dungeons will open the doors to you. However, is there any way of achieving it without spending so much time? You need an appropriate party or guild. So what should the people without such kinds of social support do? It is rather rough, to play without anyone to depend on. However, there are some benefits as well. For example, you don’t need to match your time schedules or share experience and loot. But playing alone means craving for a WoW PVE boost. Actually, there is plenty of solo-players on the plains of Azeroth. Each of them finds it difficult to progress in the late stages of the development. Daily quests is one thing, but considering the inevitable balance changes and constant necessity for comrades to group up with in order to get into a high-level dungeon… Well, it’s rough. Putting everything else aside, the process of farming decent clothing alone is quite difficult. I’d say it’s insane. But worry not! 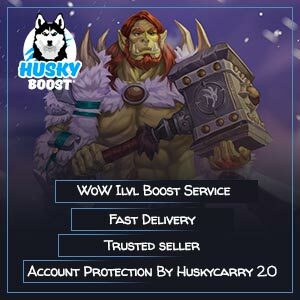 Husky offers a vast amount of different products, applicable to both game servers so everyone is able to raise their armor quality to the maximum! 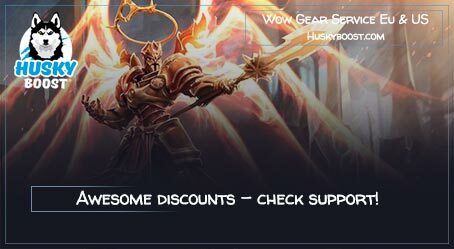 Visit our WoW section and check out the sales to get the gear you always wanted for cheap. Make sure to keep track of our special deals to get everything you ever wanted simpler than it should have been otherwise. Being Blizzard fans and, most importantly, players ourselves, we completely understand the necessity of such action and the meaning behind it. Even if you would have any doubts, feel free to contact the support manager and ask anything bothering you. We are working twenty-four hours a day, seven days a week just for you! Husky’s team will undoubtedly clarify everything so you could enjoy the order at its full! Don’t be afraid and type something right now to understand that everything’s truly great! 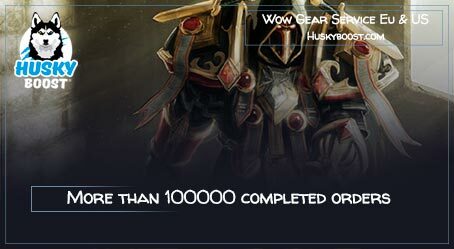 Because all of the World of Warcraft Services we carry are 100% completed!